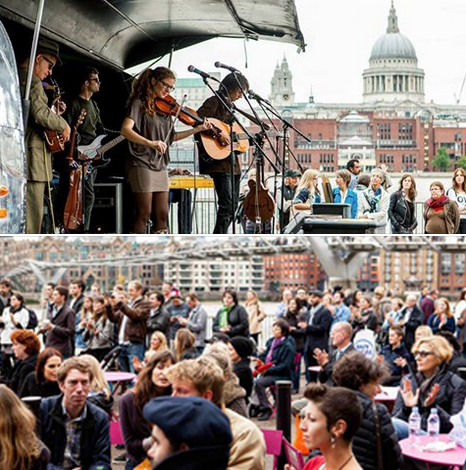 The New Roots Stage at the Merge Festival, four days of our favourite bands on stage outside the Tate Modern on the river walkway, facing the millennium bridge. There are plenty of seats and tables and a lovely little bar serving beer, wine and soft drinks, midday til six each day, and all for free! A firm favourite of the New Roots Sessions, Jack Harris was a South by Southwest showcasing artist at 17. He was the first international act to win the New Folk songwriting competition at The Kerrville Folk Festival, Texas- previous winners include Steve Earle, Lyle Lovett, Gillian Welch and Devon Sproule.. A virtuosic guitar player and wonderfully authentic folk singer and songwriter, he has shared the stage with everyone from Martin Carthy and Dave Swarbrick to Anais Mitchell and Jeffrey Foucault. New Forest singer songwriter Kirsty Merryn’s delicately introspective piano based songs and sophisticated musical style are balanced beautifully by an intimate and finely observational lyrical content. She has recently been listed in Buzzfeed’s ’34 Brilliant British Songwriters To Discover’. Chris Brambley is guitarist with UK band The Sticklers. His solo work is firmly based in acoustic folk tradition, with an intricate fingerpicking style reminiscent of Bert Jansch and John Renbourn and echoes of James Taylor in his beautifully crafted songs. He hasn’t been on the New Roots stage before, we’re excited to welcome him here for the first time. One of the finest artists to grace the New Roots sessions, Ned Roberts is a wonderfully accomplished folk musician with a timeless quality to his sound. His perfectly balanced Laurel Canyon-esque songs delivered with a poetic turn of phrase, excellent musicianship and a perfectly judged vocal sensibility sit comfortably amongst the classics of the acoustic folk world. Tonight marks the launch of his second album, recorded in L.A. and produced by Luther Russell (Noah and the Whale/ Richmond Fontaine). ‘…so gifted, possessing a fine ear for a tune and a real knack for storytelling..stunning’. A star in waiting, Jenny Lindfors recently completed a UK tour supporting Rumer at the million selling singers request. Lindfors has been described by The Manchester Evening News as “completely and utterly brilliant” and by the BBC as being: “blessed”.Her’s is a highly sophisticated folk style informed by a mid seventies FM sound , with shades of everything from Bill Withers to KT Tunstall via Neil Young and Joni Mitchell in the mix, all woven together by a unique and powerfully soulful voice. A rising star on the London folk scene, American singer songwriter Robert Chaney counts Townes Van Zandt, Hank Williams and Judee Sill as influences. His recently released debut album ‘Cracked Picture Frames’ garnered high praise in the music press, with Folk Radio UK making it their featured album of the month. Doors 7.00 pm, music from 8.00 pm sharp. Because of the nature of the performance space we cannot seat latecomers until the interval. At the forefront of a very exciting new wave of UK folk, six piece Mishaped Pearls most recent album “Thamesis’ has recieved four star reviews from The Guardian, the Financial Times and the Telegraph, and garnered the highest of praise from Tom Robinson, Mark Radcliffe and Bob Harris, highlights amongst universal acclaim from the press and media. Their adventurous song combination of the ancient and the new finds an echo in their musical make up- banjo, saz baglama, bodhran, violin and mandolin mix with acoustic guitar, keyboards, electric bass and drums, all led by the mezzo-soprano voice of Manuela Schuette. Their music’s roots in tradition expands into progressive folk and rock, eastern modal music and shows elements of contemporary classical influence. Chamber folk/ alt-folk group Tir Eolas (Philippa Mercer – vocals/flutes, Laura Snowden – guitar/vocals, Ruairi Glasheen – percussion/vocals, Georgie Harris – viola/vocals and Hedi Pinkerfeld – bass/vocals) draw on their Celtic and English folk roots, combining traditional folk and original material, from virtuosic instrumentals to 5-part harmonies. Highlights in recent performances have been Bestival, Cecil Sharp House, Royal Albert Hall, Sage Gateshead, Kings Place, City of London Festival, Milton Court Concert Hall, Ronnie Scotts, and the BBC Proms (broadcast on BBC Radio 3). The group were selected for the inaugural City Music Foundation Award in 2013, and as a result were able to record their debut album Stories Sung, Truths Told, which was released in early 2015. Projects for 2015 included a concert at Shakespeare’s Globe for a series curated by guitarist John Williams, and a residency at Aldeburgh Music alongside artist Jo Lewis. Doors 7.00 pm. Music from 19.45 pm. Because of the nature of the performance space it is not possible to seat latecomers until the interval. The Winemakers is a strikingly atmospheric 70 capacity candle-lit stone arch in the vaults of Holborn Viaduct, attached to the Winemakers Club, an independently run wine and craft beer bar. New Roots presents an evening of new composition in what’s establishing itself as an exciting new movement in ensemble chamber music. Contemporary classical, western art music, jazz, world music and folk combine with a d.i.y. indie attitude. Musicians of the highest calibre are blurring boundaries and disciplines to create a new, highly accessible form, applying superb energy, verve and startling originality to create a whole new genre. Iyatra Quartet draw on a diverse range of musical styles, rhythms and melodies from around the world to create their sound. With backgrounds in classical, jazz, Cuban, Brazilian and Indian music, they combine Indian raga with contemporary rhythms, plainchant with extended percussion techniques, and many more influences to create a unique collection of musical experiences. This collaboration between Filipe Sousa (Portugal) and Jonathan Ang (Singapore), explores and pushes the boundaries of the piano/keyboard whilst seamlessly blending acoustic and electronic sound. Drawing influences from their myriad of travel destinations, Sousa & Ang play on the precepts of rhythm and harmony, blending musical characteristics from Southeast Asia to the Middle East, whimsically translating them onto the piano, melodica, rhodes and synthesizers. Curzon and Ter-Berg grew organically out of Francesca Ter-Berg and Flora Curzon’s passion for Transylvanian music. Francesca Ter-Berg is a cellist specialising in klezmer and gypsy music. She has studied with internationally renowned musicians and teachers, most recently the legendary Manouche maestro Tcha Limberger. She performs with acclaimed folk singers Sam Lee and Katy Carr and has recently collaborated with the BBC Symphony Orchestra and Mercury Award Winner Talvin Singh. Violinist Flora Curzon’s eclectic resumé includes collaborations with Sam Lee, Talvin Singh, gypsy-jazz band Dunajska Kapelye, the Brodsky Quartet and the London Chamber Collective, and orchestras, Orchestra of the Age of Enlightenment, The Royal Academy of Music Sainsbury Soloists, Faust Ensemble, English Symphony Orchestra and the London Sinfonietta. Her own projects, Gaia Duo and Curzon and Ter-Berg give her the freedom to combine her interests and explore her own ideas and creativity. Tickets £5.00 adv/ £6.00 door. Doors 7.00 pm, music from 7.30 pm. Benedict Benjamin is the singer and songwriter with acclaimed UK indie-folk act Mariner’s Children (‘Simply astonishing…exhilarating and devastating’. Q Magazine). His brittle, heartworn and beautifully delicate compositons are sung with a wonderfully pure vocal style to match. He treads a similarly introspective path to James Vincent McMorrow and Bon Iver, with respectful nods to rootsy Americana along the way. A rising star on the London folk scene, American singer wongwriter Robert Chaney counts Townes Van Zandt, Hank Williams and Judee Sill as influences. His recently released debut album ‘Cracked Picture Frames’ garnered high praise in tyhe music press, with Folk Radio UK making it their featured album of the month. Conrad Vingoe is an award winning folk influenced singer/songwriter based in Brighton (UK). His current album, produced by the legendary Phill Brown (John Martyn, Talk Talk, Led Zeppelin, Bob Marley), has led to supports with Passenger, Turin Brakes, Sam Amidon and Chris Difford. Tickets £6.00 Adv/ £7.00 Door. Doors from 7.00 pm, live music from 7.45 pm. DOWN IN THE BASEMENT is a monthly Saturday night of rockin’ country, blues, alt/indie folk and rock’n’roll in The Harrison basement. Three live bands each night, the basement bar will be open, the stereo will be loud and the chairs will be cleared away so get yer dancin’ shoes on! Led by former Obscuritones singer Gabriella Romano, Ella and the Blisters are fast emerging as one of the most exciting new bands on the thriving London roots scene. Fusing gypsy jazz, rockabilly and swinging’ country into a fantastically catchy whole, the band combine fiddle, accordion. guitar, bass, drums, ukulele and percussion to make for a wonderfully joyous roots stew. A great Saturday night band, guaranteed to warm your heart and move your feet! Dana Immanuel is a North London banjo-toting, whiskey-drinking, poker-playing no-prisoners-taking singer-songwriter. She and her super-heavy folk-blues all girl Stolen Band make a sound straight out of the American bayou, triple filtered through bourbon, washboard, and a touch of alt-country attitude. Favourites of Steve Lamacq on Radio 2 and Radio 6, and Gary Crowley on GLR, six piece Lazy Heart Parade play anthemic indie folk with a nod to Neutral Milk Hotel and Arcade Fire, combining ukelele, violin and mandolin with a modern indie rock electric edge and attitude. Whipsmart lyrics and superbly catchy hooks backed by excellent musicianship make for a splendid Saturday night act.